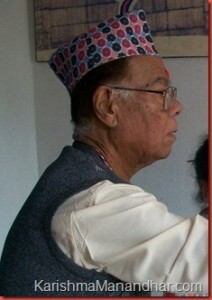 Karishma’s father-in-law and her husband Binod Manandhar’s father, Ishwor Manandhar, has died on February 4, 2012 in London. The 82 years old businessman died of pneumonia. It has been 35 years since Ishwor Manandhar had started a very popular restaurant among Nepali living in London, Natraj Restaurant. Condolence to Karishma, Binod and the Manandhar family. We wish the deceased soul rest in peace.